Do I need a separate checking account for my business? Yes; Do not mix business and personal expenses. Don’t “muddy the waters by mixing business and personal expenses.” If you are audited and have co-mingled your business with your personal expenses, the IRS will start looking into your personal expenses as well as your business. So it’s best to keep them separate. First, get an EIN (Employer Identification Number) from the IRS. Go to IRS.gov and search for EIN. Your can apply online and it’s free. Then open a business checking account at your local bank using the EIN instead of your social security number. 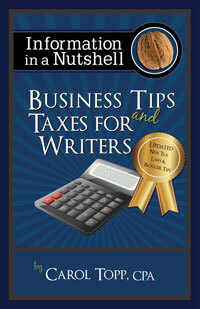 Most writers use their name as the business name to avoid having to file for a Doing Business As name registration. I don’t have any income from writing yet. How can I open a separate checking account for the writing business? Open your business checking account by transferring in money from your personal checking account and call it a loan. I recommend a round dollar amount such as $100 or $500, so it is easy to recognize on your bank statement and to remember. When your business is profitable, repay yourself from the business account. The loan and the repayment are not taxable exchanges. Should I have two separate checking accounts for two separate businesses? If the businesses are very different (i.e. no shared customers or expenses), then have two separate accounts.